Make your own Hot Sauce. 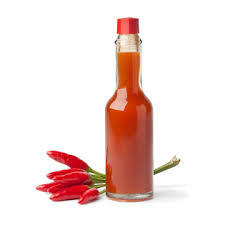 Our easy to make passage-clearing, eye-watering, fire-breathing, chili laced hot sauce will be a hit at your next bbq. The trick with using dried peppers instead of fresh is that you have to reconstitute them. Since you’re not going to cook this hot sauce, you want to be certain that your peppers plump up pretty well. I did a double soaking method that worked out nicely. Here’s how it goes! Cut the tops off of your chili peppers, then place them in a small bowl. Heat your water to boiling, then pour it over the peppers. You may need to use a spoon or two to anchor those suckers so that they stay submerged. Let your peppers soak in the water for about 30 minutes, then drain them. Add the peppers to the bowl with the garlic cloves, then pour enough vinegar over them to cover. Use your spoons again, to keep the peppers from floating, and soak for 30 minutes more. Pour the peppers, garlic, and vinegar into a food processor and add the sugar. Blend until smooth. Enjoy. You can change the flavour profile by adding lime juice, herbs etc. That’s it! Trinidad Scorpion Moruga chili peppers were used, but you could mix things up and use any hot peppers you like to control the heat. Variety of hot chili peppers available at www.firehousechilli.com are Carolina Reaper, 7 Pod Chili, Butch T, Jonah, Douglah. If you don’t like things too atomic, you can also shake some of the seeds out of the peppers before you start, since the seeds definitely up the heat factor.